Step by step instructions for do-it-yourself repairs. I don't have the u-joint or long extensions, so I dropped the trans crossmember about 2" on the driver side. I'd have dropped it farther, but I only had the factory bottle jack. I was able to get my left hand up to the sensor to guide the socket and catch the bolts. I used two 3" extensions on my 3/8" ratchet and took off the bracket that holds the end of the shifter cable housing to get my right hand in to operate the ratchet. This also allowed me to reinstall the bolts by hand and go hand tight before going to the ratchet. Not bad for a fiftysumpthin' woman that hasn't done car work for about twenty years. Proves that you never forget some things, unless Alzheimer's does it for you. I did mine about a year ago. Yes it started out as a real easy job but ended being a $450 job. The problem I had was first the top bolt snapped off then the second bolt snapped off too. I ended up having to pull it to a local shop for them to pull the trans and get the broken bolts out. The one good thing I that I did buy a cheap *** cps from ebay and only payed $13 with shipping. But from what I have heard. I am one of the few lucky people that it actually work out for. If or should I say when I have to change it out. I will be getting it from the dealer. It's not worth the risk to cheap out on this part. Last edited by RTorrez1; 05-11-2012 at 09:49 AM. I did mine on the side of the highway few months ago in the pouring rain..took 20mins but overall it was 3 hours having to wait for my wife to get out of work, for her to go to the auto parts store and get the sensor and pick up my 3/8 metric socket set. couldn't have done it without the wifey! Hardest part was trying to seat the sensor in with such little room for my hand and working the bolt. Any of you guys that have done this remember what size socket to use? Gotta do it later this week and it wouldn't hurt knowing what it is. Ok cool thanks! This is definately a great find!! I for the life of me can't figure out how to work the extensions and u-joints in to replace mine. USE gum in the socket! works great! however, the extension and universal(spring loaded so it stays at the correct angle) 3/8" drive works pretty good, but yeah he is right on with that! I used 3 6" extensions with a universal on the end of those and then the 11mm socket. This allowed my to access the lower bolt pretty easily. For the upper bolt, I laid thick cardboard over the engine for my comfort, layed on that and then reached behind the block with an 11mm combination wrench - the type with the box end offset a bit. It's tight back there and using the wrench is slow, but I've done it twice this week and it hasn't taken me more than 30 minutes either time. Dave,did you use a magnet in the socket? No magnet. If you have the hood open and enough light you can view the lower bolt progress pretty well. Even if it drops it should drop to the floor. The upper bolt is the one you need to worry about dropping into the bell housing - which wouldn't be the end of the world either. There's a removable plate at the lower edge of the housing for inspection. I'd bet you could run a magnet into there if you drop the bolt. Replacing the CPS and I was not lucky enough to have mounting bolts to remove. Instead I have mounting studs and 2 nuts and after removing the nuts the studs are still blocking the CPS from sliding out of its housing. Any tips to remove the studs? Put 2 nuts on the stud and using a wrench, turn the inner nut against the outer one and the stud should come out. I never worked on a 2.5L, but the crank sensor with an automatic transmission uses studs. The manual uses bolts, like the 4.0L. Never asked why, but now im curious. 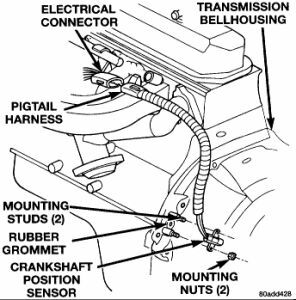 For what its worth, the 97 FSM simply says to remove the bolts or nuts, and remove the sensor. It points to a rubber grommet, but says nothing about it when removing the sensor. This is the same pic as shown in the FSM. Your sensor doesnt just slide off the studs?